September 23, 2012 marked the 50th anniversary of the crash of Flying Tiger Flight 923, when the Army-chartered aircraft was forced to ditch in the North Atlantic in the dark of night during a raging storm some 500 miles off the west coast of Ireland. Seventy-six passengers and crew were on board. Twenty-eight died and 48 were rescued. After the initial flurry of Irish and English media reports of the crash and rescue, and after sporadic hometown obituaries and a few stories of those who miraculously survived, world-wide attention shifted to other serious international issues, such as the Cuban Missile Crisis and continued threats of rekindling the Cold War with the Soviet Union. Virtually no information emanated from the US Army after the crash of the plane full of fresh combat paratroopers and military families on their way to bases at or near Frankfurt, Germany or on official holiday leave. The incident simply sank with the Super Constellation into historical darkness. There was no reunion and no public memorial anywhere. Survivors and their families and those left behind were on their own to find out what they could from the very little that was made public. Husbands lost wives and wives lost husbands. Children were left fatherless. A mother and her two children were taken in one crash of the waves. Telegrams were written and delivered. A brief official report was submitted. Memories faded. For me, not being seriously injured physically, Flying Tiger 923 was a driving force in my life. I had written a first hand report while on the rescue ship and the story was featured on the front page of the British Daily Mail. That story led to my career in journalism and that led to my creation of a personal website. That early website was hidden within my own company website, none-the-less it was discovered by a young woman who lost a brother, a young man whose uncle went to the Army but never came home, by the son of the aircraft’s captain, and by a number of pilots who enjoy researching air disasters. My book, Born Again Irish, was published in 2007 stirred a surprising number of inquiries from people with links to the event. A highlight was a tea party at Mercy Hospital in Cork, Ireland, which was part of my book launch. Five nuns who were present and working as nurses at the hospital that day, some 45 years earlier, were at the tea party to join the mini-reunion. The nursing nuns were called upon to minister to the injuries of the 17 survivors who were evacuated from the Swiss rescue ship as it paused only eight miles off shore from Galley Head lighthouse. Some 60 stories were written based on limited newspaper references and telephone interviews, and by several survivors or their relatives and members of rescue teams. These accounts provided a lot of new and detailed information available by the 50tth anniversary ceremony on September 23, 2012 at Galley Head. A plaque was unveiled and hung facing out to the sea towards the crash site. I thought the mission was complete. However, since then, even more people have contacted me and offered even more information. So, for those who have just found this web site, and for those who have been following the stories as they were being posted, and for current and future historians, for political science graduate students, and for some of the world’s best authors and movie script-writers, and for the growing number of descendants of those involved, and for absolutely everyone else in this world, I am picking up where we left off at the 50th anniversary. The story of Flying Tiger 923 continues! 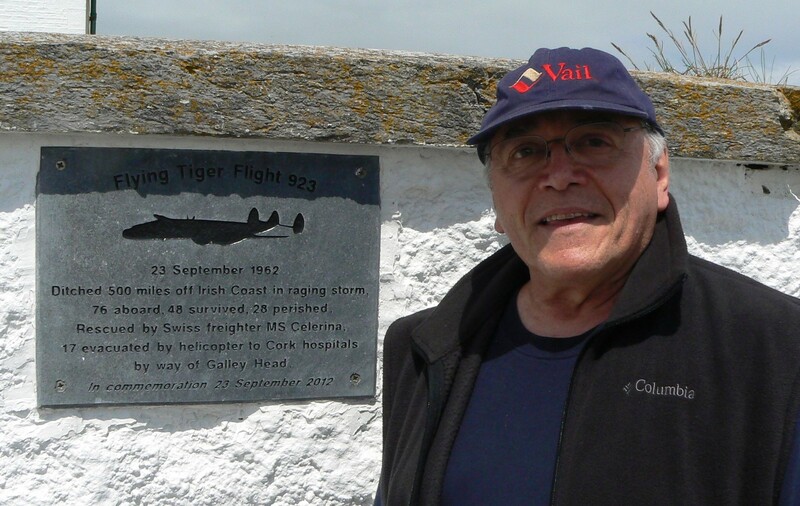 –– Above, Fred Caruso, a Flying Tiger survivor, poses beside the commemorative plaque dedicated on September 23, 2012 at Galley Head Lighthouse, West Co. Cork, Ireland. That plaque is now officially part of the “Irish Lights Historical Commission” at the historic lighthouse. View the lighthouse and grounds by clicking here. This entry was posted in Uncategorized and tagged Flight 923, Flying Tiger, Flying Tiger Memorial, Fred Caruso, O'Caruso. Bookmark the permalink. Love your web site dad! I’d love to see your story on the big screen some day! I am slowly progressing my way through this amazing web site. I was totally unaware of this crash. Thank you for such an effort at compiling it. Is there a publication dedicated to the crash and rescue?. Is “Born again Irish” an autobiography of the life and times of Fred Caruso? Just went to lunch with Frank Ruffalo who was a army paratrooper who survived this crash. He was relating his experience and mentioned Fred Caruso. What a fascinating and horrifying story! Frank is from Chicago. Our wives were best friends in grade school. They reconnected at a recent reunion. Although from the same neighborhood, Frank and I did not really know each other, but I remember others talking about his ordeal. He does not use the internet, but I plan to tell him about this web site. He did have a copy of the Saturday Evening Post story about the crash. It does make you realize the incredible sacrifices young people make as members of our armed forces. Thank you for this site. He does not have an email, but I will call him and let him know you want to get in touch. Contact Frank at (708) 653-8549. His wife gave permission to send this number. They do not have email. I just found your website and can’t began to tell you what it means to me. My cousin was a member of the flight crew who died in this crash.